The British approval of the costly Hinkley nuclear power station still faces major obstacles in Brussels. While my American readers settle down on Tuesday night to enjoy the end of the political ambitions of Ken Cuccinelli at the hands of a Democratic party hack with zero experience in government, I’m settling in for a long comedy serial: Sir Humphrey Appleby vs. European Commission in re Hinkley Point C.
The dying nuclear industry (my take on the economics, politics, mascot) has just scored an extraordinary win in Britain. 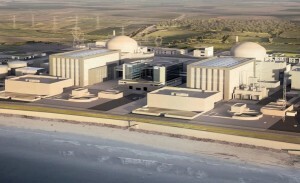 The government will commission EDF and its Chinese partners to build the Â£16bn, 3.3Gw, two-reactor Hinkley C plant. It’s a fixed-price contract: but to get this protection from the high construction risks, it has had to guarantee an FIT of Â£92.50 ($147.9, â‚¬109.3) per megawatt-hour for no less than 35 years from the supposed completion date of 2023, indexed for inflation. And EDF will be compensated for any curtailment from wind and solar. The FIT is double the current British wholesale price, twice the current onshore wind FIT, and considerably higher than current German non-indexed FITs for on-and offshore wind and solar. The price of both wind and solar is bound to fall; the British government accepts this, but it lowballs the trend rates. It thinks the price of solar will only decline by 3% a year, far lower than experience and typical industry forecasts. The first thing I thought about Detroit is that the state’s appointment of a receiver demonstrated the Republican governor’s profound indifference to the democratic process of a Democratic city, not to mention a white governor’s profound indifference to a black city.Â Â This may be true, but it’s also true that Detroit’s finances are such a catastrophe that, like New York in the 1970s, it seems to need an outsider to get its house in order. It helps that the trustee is African-American, though not very much: even temporary government without the consent of the governed should cause us alarm. The second thing I thought about Detroit is that selling off the collection of the Detroit Institute of Art, which the trustee estimates would be sufficient to retire all of the city’s debt, is the best of a number of bad options. Museums nationwide are hyperventilating at the prospect, but they also think it’s sensible to keep on hand huge numbers of items that no one ever sees.Â I don’t quarrel with the need to have a deep collection for research purposes, but I also don’t see why it’s considered bad form verging on unethical to sell the parts of the collection you’re not using in public to sustain the parts of the collection you ARE using in public, and at the same time not coincidentally making the sold pieces available to the public, albeit in a different location. If there had been a Great Fire of Detroit, and the whole city destroyed, no one would argue that recreating the city’s art collection should take priority over food and shelter for the city’s people.Â The years of financial mismanagement have incinerated Detroit just as surely as a physical fire; why shouldn’t we pay more attention to basic needs than to cultural institutions? And isn’t the whole function of assets to provide financial security when income doesn’t suffice? Again, I wonder about the racial composition of those who champion the inviolability of the collection as against the racial composition of those who think it might be necessary to dispose of it. The state’s Attorney General has opined that the city may not sell them because they’re held in trust for the citizens.Â But “The United States shall guarantee to every State in this Union a Republican Form of Government,” and I don’t notice anyone’s raising a ruckus about the loss of that part of our patrimony. The third thing I thought about Detroit is that the bondholders’ interests are being given absolute priority over the interests of current and former employees, whose pensions are at stake. This is the case in Illinois as well, where at least some portion of the pension “crisis” could be solved by refinancing the debt and stretching out repayment but where that solution is not even considered because the bondholders don’t like it. I understand the value of the municipal bond market to cities’ ability to expand infrastructure but municipal bond investors are investors and should be prepared to accept some pain when they toss their dollars into what’s obviously a money pit. And the fourth thing I thought about Detroit is that it’s Americans’ closest analogue to what’s casually referred to as “the European debt crisis,”Â throughout which salvaging the Euro has meant satisfying bondholders at the expense of people who’d like to work or collect their pensions.Â Â Very few commentators seem aware that the real crisis is one of self-government (or its destruction), or that the Germans have managed to do through economics what they couldn’t do through war, that is, run Europe.Â When externally-imposed austerity hit Greece, all I could remember was the bumper sticker from the era of the junta: “Greece: Democracy born 508 BC, died 1967 AD.”Â Or, this time around, “reborn 1974, killed again 2011 or -12 A.D.”Â As the saying goes, same s**t, different day. Back to Detroit: if I were trustee, I’d sell off DIA’s assets in a heartbeat and use the proceeds to protect employee pensions. If there was anything left for the bondholders, fine; if not, too bad: it’s the pensioners who paid their share and are entitled to what they were promised. Even after years of trashing public employee unions (brought to you by the Heritage Foundation and other fronts for wealthy people who don’t like to pay taxes or see working people make reasonable money), there must be some court somewhere willing to recognize that the obligation of contracts shall not be impaired. Of course, I would never be chosen trustee, but that’s not the point. The point is, my solution is what would happen if Detroit were still governed by its people. Detroit: Democracy died 2013 A.D.
An experimental apartment block in Hamburg heated by a skin of algae. However, this is as far-out a building as you’ll ever likely to see. The green coating isn’t paint, it’s algae behind glass in a thin exothermic [Update] bioreactor. The circuit includes biogas extraction and of course the algae eat carbon dioxide, so the building – with other less ostentatious tweaks – is claimed to be completely carbon-neutral. Hamburg is cool and wet, so buildings need heating almost all of the year. The technology will therefore never take off in Haight-Ashbury or the liberal bits of Beverly Hills. [Update: this speculation retracted below in comments] But there’s nothing to stop Barack Obama from building himself a carbon-neutral slime palace retreat in Maine or Minnesota. And how about the Governor’s mansion in Alaska? IBA website in German, via CleanTechnica. The strange belief that militias are necessary for liberty. For the American people can no more meet the demands of today’s world by acting alone than American soldiers could have met the forces of fascism or communism with muskets and militias. The question: what did the authors of that little sentence, the Second Amendment, mean by it? is subject to the historical analogy to Goodhart’s Law : when an indicator is used for policy, it gets distorted (see: monetary targets, Soviet central planning). To get an unbiased evaluation of the original intention, you’d have to hire a historian from Mars and deprive them of all data after 1800. How does this stand up as a claim of fact? List of free states: Great Britain (*), France, Netherlands, Switzerland, United States. List of free states with militias or citizen armies: Great Britain, France (chaotically), Switzerland, United States. * when not considered as a tyranny under the iron gaiters of George III. Author James WimberleyPosted on February 18, 2013 February 20, 2013 Categories Everything ElseTags Britain, Constitutional politics, Firearms, Germany, History78 Comments on Dad’s Army for Freedom! 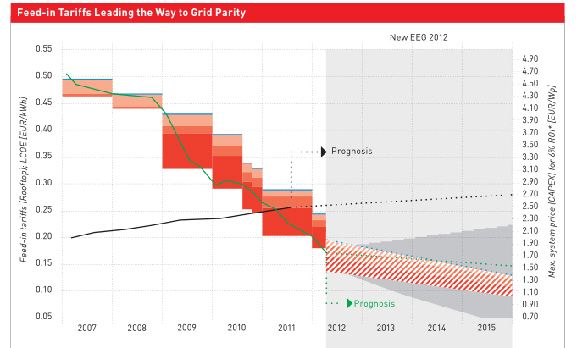 Confirmation that solar grid parity has arrived in Germany, and what it means. Sorry for the lousy screengrab of a brilliant original. The rising black line is the retail price of electricity; the falling green line is the installed cost per watt for systems up to 100kw. What it shows is a discontinuity in history, an event of critical importance, [rant] a beam of hope through the black clouds of selfishness, lies and despair threatening the survival of our civilisation in a very Oilocaust [/rant]: the arrival of residential solar grid parity in one large, rich, and northerly country. The German feed-in tariff (FIT) for solar electricity is already below the average retail rate of 25â‚¬c per kwh: 21.4â‚¬c deducting the cross-subsidy of 3.6â‚¬c for renewable energy, or 4.7$c. This high price by American standards does include a component for greater reliability and amenity; you rarely see an overhead cable in a German town. The FIT is still well above the wholesale rate, but so what. The datum is crucial confirmation of the insiders’ prediction I trumpeted here that solar grid parity will now rapidly spread through most of the inhabited world, driven by technology and economies of scale alone, more or less regardless of policy (as long as it isn’t actively obstructive). Greek (and of course German) electricity is much more reliable than American. A statistic you probably don’t know is SAIDI, system average interruption duration index. It means the average number of minutes per year for which the customers of an electricity network are deprived of power, not counting short interruptions of 1-5 minutes, planned interruptions, or “extreme weather events”. It’s one of the two main internationally agreed indicators for grid reliability. Its sibling SAIFI is an indicator of power cut frequency, and is less significant for most customers. Spanish labour costs are painfully converging with German ones. A German family gets solar panels installed, hooked up and registered in 8 days. Thereâ€™s an article in the most recent issue of PHOTON describing a German family that got a 4.6 kW PV array installed and interconnected to their roof 8 days after calling a solar installer for the first time. The homeowner had a proposal from the installer within 8 hours. The installer called the utility the morning of the installation to request an interconnect that afternoon. The installer called at 10 am, the utility came and installed 2 new meters and approved the interconnect at 2:37 pm â€“ the same day. The online registration of the PV system with Federal Grid agency and approval of the feed-in tariff took 5 minutes. Germany does not have permitting for installing solar panels on residential rooftops. Ah, but you can’t have delinquents signalling to alien spaceships with weird black antennae, or alarming the Stepford citizenry with kn*ck*rs hung out to dry in gardens and shockingly visible from the public highway, can you? PS: the BSW German index for the average total cost per watt of installed rooftop solar PV systems up to 100kw now stands at â‚¬1.776, or $2.18. Typical US prices are double. A German company builds a 4 MW solar PV plant in 15 days. On June 13, the German municipality of LÃ¼chow-Dannenberg in Lower Saxony granted planning permission for a 10 MW utility solar PV plant on the site of a former sawmill. The first phase of 4.7 MW has just been completed. German company ib vogt (capitals fashionably omitted) built the thing in 15 days. This is certainly a carefully planned stunt. The rest of the plant will be ready in September, which I take it to represent a more normal pace (3 months). Clearly vogt had every reason to expect the permit would be forthcoming, and drilled their own staff and their suppliers. 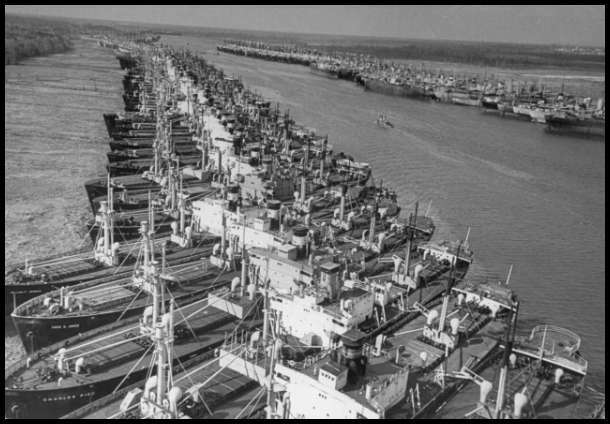 Still, the feat is real; like the Liberty ship SS Robert E. Peary that Henry Kaiser built in November 1942 from keel laying to launch in 5 days instead of his typical 14, and the British Wellington bomber built by Vickers in 1943 to first flight in 24 hours. These are stunts that demonstrate a formidable everyday technical capability: and in causes of similar importance. Solar PV panels are a global commodity and prices don’t vary much between countries. Where Germany stands out is its lower installation costs. The German Solar Industry Association’s index of installed cost of PV per watt, for systems up to 100kw, stands at â‚¬1.78 ($2.24). ib vogt is a typical German Mittelstand company, except that the patriarch is a matriarch (Dagmar Vogt). It’s highly specialised – all they do is build PV plants; big enough to be stable (annual turnover â‚¬48m) but not too big to lose the cohesiveness of a family business. What is of wider interest is that vogt is much too small, unlike Kaiser and Vickers, to internalise many of the economies of scale we are looking at. The economies are spread throughout a thriving solar PV ecosystem: every stage in their German supply chain – pile drivers, mount and panel frame makers, module and inverter manufacturers – has built up a lot of experience and can evidently respond quickly and economically to a rush order. There is no magic to any of this. It is surely being replicated today in China, California, Australia, and Italy; and it will be replicated in Mexico, India, South Africa, Florida and Brazil, as long as they do not frustrate it by protectionist regulation. The current wave of bankruptcies of higher-cost solar panel manufacturers is not the sign of an industry in real trouble, just the invisible hand at work in a cyclical slowdown marking optimistically purchased assets to market and changing their managements. It won’t reduce overcapacity: the scenario of massive capacity reductions only makes sense under an international cartel, which doesn’t exist and would have to be organised in the worst possible conditions. I’m therefore much more inclined to believe the same forecaster’s prediction of a 40% cut in panel production costs by 2015, realistically benchmarked on the most efficient Chinese producers today. Prices will continue to drop fast, well below grid parity in many markets. The vagaries of subsidy policy – though not regulatory obstacles – will become widely irrelevant. BTW, whatever happened to hard-driving but decent and public-spirited American tycoons like Henry Kaiser? What Shall We Call the New Franco-German Partnership? Merging first names to make Frangela is too familiar for leaders who barely know each other. Homer is too American (or worse, Greek). Merkollande sounds too close to Merkozy. That leaves just the shortened Merde, which at least sums up the state of the euro. Author Keith HumphreysPosted on May 23, 2012 May 23, 2012 Categories Everything ElseTags France, Germany, Humor10 Comments on What Shall We Call the New Franco-German Partnership?